Butler, Party of 4: Need NEW factory wheels or tires? Well, here is the newest endeavor!! My hubby can do/fix/make anything....any painting, staining, custom tile or flooring, or carpentry work/additions. When I first met him, he and his dad were selling tires online through e-bay & Craigslist, and he has continued to do it off an on for the past few years. Recently we decided it's be a good idea to build a website, and HELLO, I am a business education/technology teacher. Building websites is a big part of what I teach! Along with some minor graphic design, photo editing, etc. So, now we can add TIRE MAN to his repertoire! 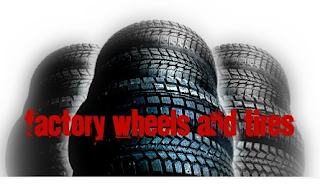 If you or anyone you know is in the market for some factory wheels or tires, mostly for Chevy, GMC, or Ford trucks or SUVs, you have GOT to check out his inventory. He can provide the same quality products you find at the dealership or other tire businesses for MUCH cheaper. (If you contact him, he can look for wheels/tires other than what I listed....just let him know if you have a special request and he will work to find it.) Factory wheels and tires, as I have recently learned, means that they are NEW takeoffs direct from the dealership (they have less than 50 miles, which is typical for NEW cars!). Check out our site (but don't be too harsh....it's a work in progress!!). Feel free to contact us with any questions or concerns, and please share the site with anyone you know who is in the market for new wheels and tires!! I can vouch for him....he's honest, reliable, trustworthy, and works to have 100% customer satisfaction. He's a perfectionist....it drives me nuts sometimes at home, but makes for a good businessman.